You will need the hostname, which in this case is nyx5541, from that message to set up the tunnel. From Windows, we recommend that you use PuTTY, which is available as part of the UM Blue Disc. With PuTTY, you need to set the port forwarding from the configuration menu. You will need to reset this each time the VNC port changes. 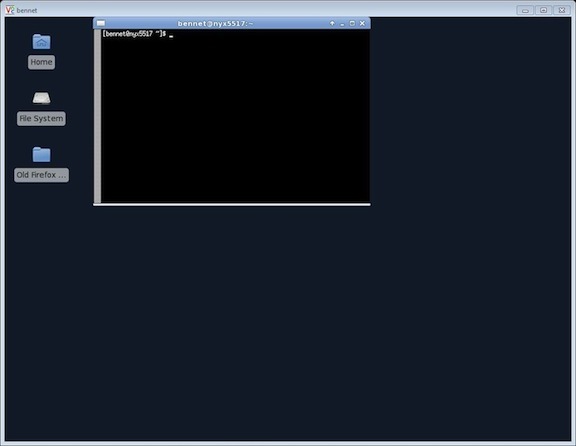 For more details: Configuring a VNC tunnel with PuTTY. Now that you have a port forwarded, you are ready to connect your VNC client to your running VNC server. Choose the link from menu at the top of this page that corresponds to your VNC client to see what the screens look like. The VNC client will have a place for you to enter the host, which is usually localhost or the IP number 127.0.0.1, the Display (desktop number), and VNC password. Upon successful completion of the connection, you should get a screen that looks very much like the following.